Bright sunlight can boost your spirits and chase away gloom. While some do not like summer months because of the dust, sweating and humidity, there are others who love summer months and going out on such days. Summer is the ideal time for getting a tan on the skin and to enhance your appearance. However, when you try to get tan on your skin, it is important that you stick to the safety measures. All methods that you use for tanning is not safe. The tanning beds are not natural. Moreover, when you spend hours lying on the beach, your skin may be exposed to the UV rays that are harmful for the skin. Applying the sunscreen can give protection to your skin, but you cannot always depend on it when you spend long hours in the sun. Using natural remedies is best for tanning. We all use coconut oil on your hair to keep hair healthy and in good condition. We also use for cooking purposes. It is great for keeping your hair well moisturised and healthy. But do you know you can also use it for tanning as it is made up of unrefined and pure Coconut Oil which is completely safe to use. Coconut Tanning Oil helps in avoiding the harmful reaction caused by the UV rays. 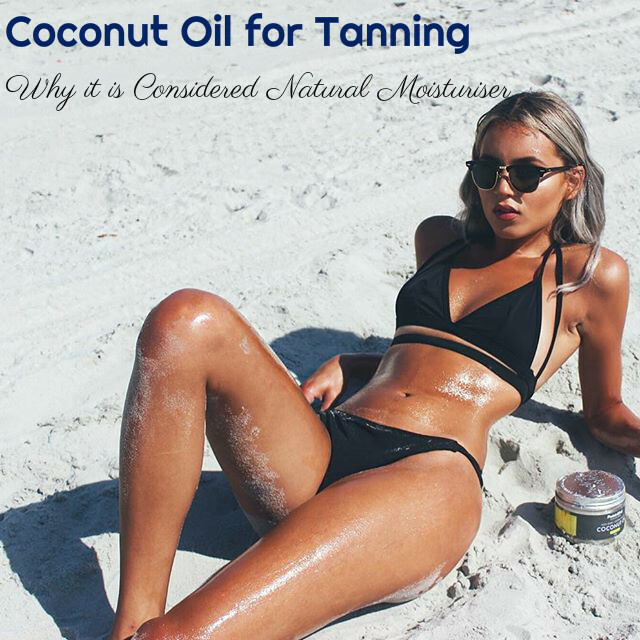 Why Coconut Oil is used for Sun Protection (Tanning)? Coconut oil helps in keeping your skin hydrated when you take sun baths. Sunscreens may not have the ability to keep your skin hydrated like coconut oil does. This is because of the presence of natural fatty acids in this oil. This ensures that your skin stays well-moisturized even hours after you apply it on your skin. By applying coconut oil on your skin, you can prevent your skin from getting dry and wrinkled after you lie for hours in the beach under the sun. Coconut oil helps in keeping your skin nourished and giving you a tanned look without affecting the texture of your skin. When you apply coconut oil as it is or apply it after you mix it with other oils or ingredients for tanning your skin, it forms a layer on your skin. This layer helps in reflecting some of the UV rays that fall on your skin and thus helps in protecting your skin. When your skin is exposed to the sun constantly, your skin can turn dark and dull. Applying the coconut oil on your skin can help in making your skin look shiny even after you get the tan. By applying this oil, your skin becomes darker and shiny. It is the melanin in the skin that helps in giving colour to your skin. Coconut oil gets absorbed by the skin faster and helps in energising the melanin producing layer beneath your skin. As a result, you will get a tan faster. This means that you will have to spend less time in the sun. When you want to tan your skin, you will have to lie on a sea beach or an open ground for hours. This can expose your skin to various germs and microorganisms present in the surroundings. Most of it takes place even without you becoming aware of it. Coconut oil is known for its antimicrobial and antifungal properties. So, applying this oil on your skin can protect your skin from getting infected by the germs present in the surroundings. When your skin is exposed to the sun, you will not only get a tan, but your skin also will be able to absorb Vitamin D. Vitamin D is essential for various physiological functions of the body. When you apply sun-block creams and sunscreen lotions on your skin, they not only block the UV rays, but also block Vitamin D. So your skin will not be able to absorb this vitamin. But coconut oil blocks only the UV rays and not Vitamin D. This makes it more effective for your skin than the sunscreens. The sunscreens that you can buy from the market are usually loaded with chemicals and ingredients like paraben and solvents, which can cause harm to your skin. Even the ones made by reputed skin care brands may contain chemicals and other harmful ingredients. They do contain SPF that helps in protecting your skin form the damages caused by the UV rays. But the chemicals in them can cause side effects. People who have sensitive skin suffer more by applying sunscreens. Different forms of sunscreens, like gels, creams and lotions, can cause such side effects. Coconut oil, on the other hand, does not contain any harmful chemicals or ingredients in it. So, it does not affect your skin negatively. You can apply coconut oil without and worry and get a tan. Using coconut oil for tanning is very simple and easy. Take a generous amount of coconut oil in your hands and apply it all over your body. Massage it well on your skin, so that the oil gets absorbed by the skin properly. Depending on how sensitive your skin is, you can use a hat or an umbrella. You can reapply the coconut oil on your skin every half an hour during the exposure to the sun. Using virgin and organic coconut oil on the skin gives you best results. Try to avoid using the refined and perfumed coconut oil because they do not contain all the goodness of the coconut oil. Remember that coconut oil itself cannot offer full protection to your skin from the UV rays, particularly when your skin is exposed to the sun for long hours. So, it is better that you also dab some good quality waterproof sunscreen with SPF 30 for better protection of your skin. The best way is to mix some sunscreen with coconut oil and apply it on your skin a few minutes before you step out and lie in the sun.